The promo is open to existing cardholders of Unionbank Credit, Debit and Prepaid (EON). Store exclusions apply to Sunnywood, Spice Island Trader and Paymaya. Applicable to new Takatack customers. Per DTI-FTEB Permit No. 0659 Series of 2018. Browse the site and add an item to the cart. Input and select your delivery address. Select your payment method as “Visa” and checkout with your UnionBank Card. 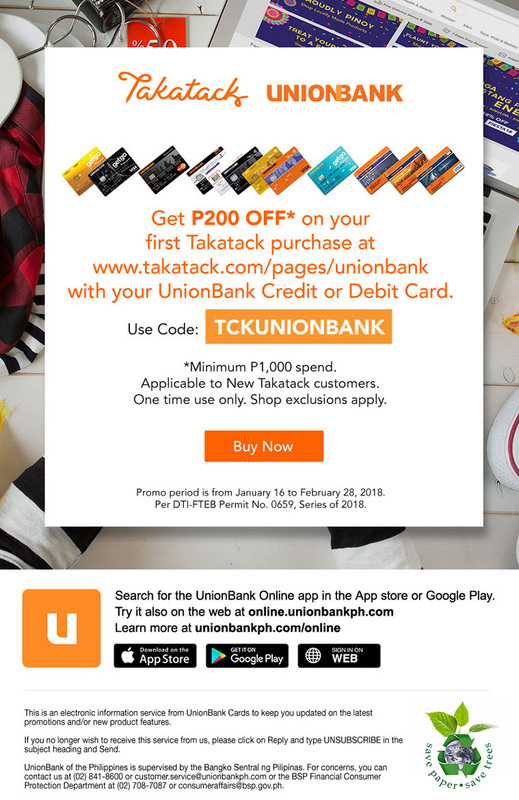 Enter the code "TCKUNIONBANK" as your coupon code. Once you click “Apply”, your total will reflect the discount. Click “Place Order” to finalize your order.